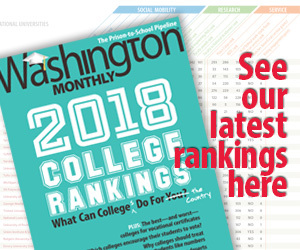 So we’re going to have another “sneak peek” from the June/July/August issue of the Washington Monthly at some point overnight, and it will be of great interest to the serious political animals. It involves a certain GOP presidential wannabe. * WaPo’s Gold and Sullivan give a long look at how Marco Rubio’s beginning to light up the donor circuit, though more with bundlers than with Super-PAC billionaires. * Dude accused of shooting at George Zimmerman in road rage incident likely to offer “stand your ground” defense. * At Ten Miles Square, Martin Longman goes after “liberal” pundits whose knees jerk in sympathy with the plight of political insiders who get caught doing things for which lesser breeds would do long hard time. * At The Grade, Alexander Russo encourages education reporters to disclose their own experiences with the system. * At College Guide, Stephen Burd endorses a “Pell Bonus” to encourage colleges to enroll more low-income students. * Extreme Eating Award goes to Red Lobster for meal that can, with a drink (a Lobsterita! ), pack on 3,600 calories.